Looking for a new racing game that throws realism out the window in exchange for fun? Let’s see if GRIP: Combat Racing fits the bill. 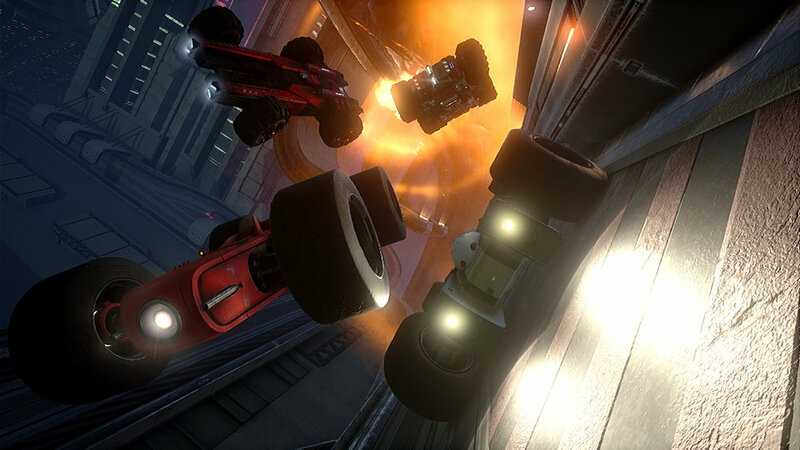 Imagine the love child of a three-way romance between Mario Kart, TrackMania and my childhood favourite Rollcage, and you’ll get the formula that lies underneath GRIP’s high speed, gravity defying, weapon-based racing. In fact, they got Rollcage programming veteran Robert Baker on this project, and the inspiration is very clear. Worked and reworked for the past couple of years on Steam Greenlight by Wired Productions, we are now faced with a final product that is making its way onto all the major consoles. It’s been in the oven for a while, and with the help of an active Steam community, they’ve been able to iterate and develop further into a game that feels satisfying to dive into. Visually, it does push the Unreal Engine 4 with speeds of up to 767mph, which does feel deathly fast at a silky smooth 60 FPS. The worlds are nicely realised with varied colour palettes, which alongside a curated soundtrack with some help from underground electronic mega-label Hospital Records makes for an encompassing experience with heavy beats and even heavier missile hits. But let’s be honest, you didn’t come here for a feast for the eyes and ears. You came here for a fun aside from the day-to-day in the form of an insanely fast racing game that plays well. And I can wholeheartedly confirm this plays well. The steering feels grounded, the controller layout makes sense and feels comfortable, the enemy AI is challenging enough without feeling impossible to overcome. And then you realise this is all the game has to offer… Multiplayer can be addictive at first, the different car classes provide some diversity to master, and the levelling system is a nice bit of window dressing to give you a sense of progression. But after you’ve spent a couple hours on a batch of well-designed tracks, followed by the Carkour circuits, you realise that GRIP has fired off all its shots. This is the whole game, and I would forgive the normal player for growing a little tired of it after a while. But this is the beauty of the genre they are in and the finely tuned gameplay afforded to them. There are plenty of different ways to flesh this game out - a combat mode? A stunt points-based mode? A quick Battle Royale mode with cars? The choices are endless, and this team will need to make those decisions rather quickly. Because what you’re left with is a nice distraction - a perfectly fine game that will keep you entertained until the repetition kicks in. It’s a shame this game is coming out in the shadow of Red Dead Redemption 2 and amongst a mountain of huge AAA game releases, as this is not going to get anywhere near the amount of recognition it deserves. At the core of GRIP is a good game… But for £33, I’d definitely try it first and see whether you can hack that repetition.